After helping our customers protect their vehicles for more than 25 years, LINE-X is the leader in automotive aftermarket and protective coatings. With more than 500 stores operating across the globe, LINE-X has you covered. Ultimate Linings has spent more than 30 years as the robotic, industrial, and manufacturing protective coatings industry leader. Together, IXS Coatings is the largest supplier of protective coatings and polyurethane foam solutions in the world. Work trucks and trailers take a beating every single day. Tanks and pipelines suffer at the hands of harsh chemicals. Roads and bridges are constantly exposed to extreme weather. All these factors translate to costly repairs, lost productivity, and decreased value. What if there was a cost-effective way to keep your most vital industrial and manufacturing assets stronger, longer? Now there is — IXS Coatings. Whether your industrial or manufacturing problems require turnkey readiness, robotic integration, or a completely custom design, our experts will find the right solution every time. IXS provides unparalleled service, training, and technical support that you can rely on. We understand there will never be a one-size-fits-all fix for protective coating problems. That’s why we take a hands-on approach to every project, starting with a site visit and consultation. Once we understand your process and goals, we turn our focus to teaching you about the opportunities available for durable, long-lasting protection. Our in-house R&D and testing facilities give us the power to customize the ideal solution for your specific needs. Once we find a solution, we stand by you at every step — from installation and training to technical support and service. We understand that spray-on polyurea protective coatings are an investment, and we want our clients to feel confident and empowered at all times. 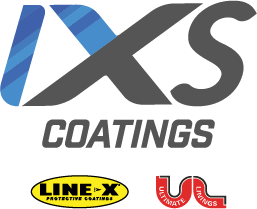 To give you a full range of industrial and manufacturing protective coatings assets, we’re proud to introduce IXS Coatings. We’re always happy to hear about your application so we can help you determine the ideal polyurea protective coating solution. If you’d like an award-winning consult, reach out to us.